Anne Bessand-Massenet Interview with Bruce Duffie . . . . . . This interview was originally published in the Massenet Newsletter in January, 1988. The biography, photos, links and end-credits were added for this website presentation. For some strange reason, when the public thinks about great composers, they hardly ever equate the musician with any kind of personal life or family. There are exceptions such as Bach and Wagner, but every creator leaves a human legacy as well as an aural one. A few months ago, it was my great pleasure and privilege to speak by phone with the heir to Massenet. She is now fulfilling her duty to the lineage and to the world, and eventually will publish the master’s letters and open his country house as a museum. 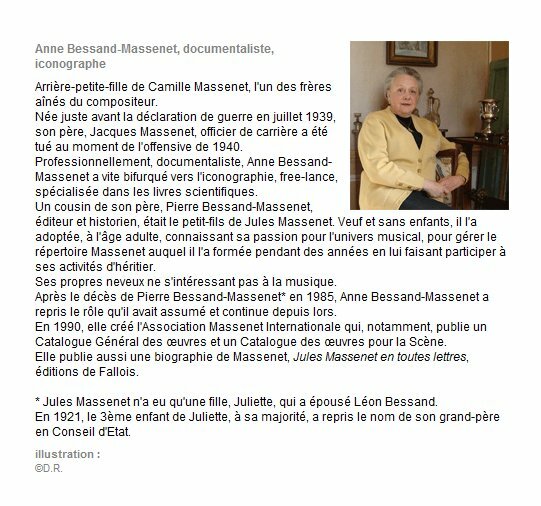 She was most gracious, and began our chat by introducing herself precisely… ..
Anne Bessand-Massenet: My name is “Bessand-Massenet.” My father was Massenet’s great-grand nephew. My father died when I was just a baby. Massenet’s grand-son, my father’s cousin, adopted me, so I’m an adopted great-grand-daughter, and really a great-grand-niece. So I’m related on both sides. I was brought up to all of this. Bruce Duffie: Are you now the guardian of the Massenet legacy? AB-M: Yes. I am the trustee of the repertoire. I try to see as many of the productions as I can, and to look after them. It’s rather difficult because I’m not supposed to let my own taste be the first thing I think of. I have to do what is best for Massenet’s music. I don’t like everything, but I let things go because even if it’s not my taste, the music is good. You see what I mean? I have to be always objective, and that’s very difficult sometimes. BD: In listening to the music of Massenet, how do you feel it compares to that of the other French masters, and to the other great composers of the world? AB-M: One thing which is important is to note that it’s not really the end of a period, but really a beginning of another. So when I listen to his music, I think of Ravel and Debussy, not of Meyerbeer. He was a very good teacher, and had a great influence on the musicians at the National Academy of Music – whether they were in his classes or not! This is true even of Ravel, who was never his student, but met him many times. BD: Are there any unpublished manuscripts lying around waiting to be done? AB-M: Yes, little ones including a vocal quartet which I found in his house. Nothing big, though, unless I find one somewhere! BD: Is there anything in the family background which you feel is important that has not been brought out to the public as yet? AB-M: I like to speak about him because I feel he was not very well-known as a man. He worked so much and his personality was very difficult to understand. He worked a lot and was up at 4 AM, and was not the kind the go out at night. But he was a very kind man. I have many letters he wrote to his wife, and she was his private life. Many things have been said about him, but I have no proof… I am going to publish the letters. He wrote about his works. One letter to his wife says, “I finished Manon yesterday. You will see, it will be a great success!” He had a great sense of the theater. He knew also all the possibilities of the voice, and all the singers tell me that it’s very easy. You just have to follow what is written, and that’s why they like doing his music. 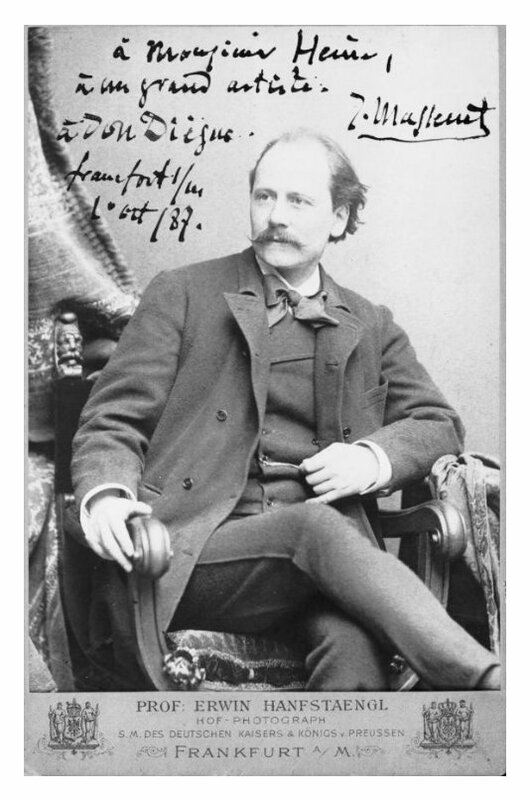 There is one other thing which may not be generally known, that Massenet’s mother was German. She had a French name, but it was a German family. They had been French, but had gone to Germany two centuries before, so she really was German. She was a very good musician, a good pianist, and that is why he started piano very early, when he was about four years old. She was the only one who was a musician, the rest were mathematicians. BD: There seems to be a strong connection between music and mathematics in many places. Are you a musician, also? AB-M: Not professionally. I studied singing for two years and I love it, but it’s not my profession. I’m an iconographer, so I illustrate historical books with prints and sketches and paintings. It is up to me to be sure that what goes into the books is accurate. I work mainly for the National Printing Company in Paris. BD: Then let us approach the music from this angle. 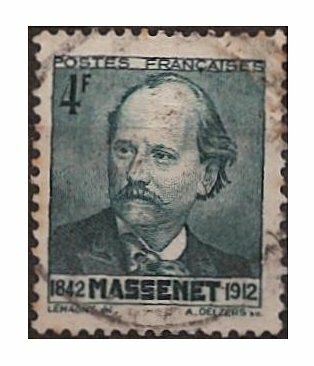 Do you feel that the productions and recordings of the music of Massenet are being given accurately to the public the way he wanted them? AB-M: Sometimes, of course, but not always. Now we are looking too much for great voices and I don’t think that it’s always necessary. For instance, there is one recording of Jongleur de Notre Dame which I like and I know the singer very well, but it’s not quite the style of the work. It’s too loud and there’s too much singing. Do you know what I mean? BD: Too much singing and not enough music? BD: Which do you feel are the recordings that do the most to bring the style of Massenet forward? BD: You’ve talked about much of Massenet’s music and yet not mentioned the two biggest operas – Manon and Werther. AB-M: (laughing) Yes, because everyone knows them. He wrote about 28 operas and there are so many which are never done, and everyone knows about Manon and Werther. We mustn’t forget the other ones – Cherubin, Ariane, Cleopatre, and Sapho, which I very much enjoy. There are also several ballets which are not parts of the opera. I wish a choreographer would do them. BD: Are there any of the operas which you feel are particularly weak? AB-M: Yes – I must say Bacchus, but it’s not because of the music. The libretto is impossible! I looked at it with a conductor, and it’s impossible to put on. We should think about it perhaps for a ballet. It’s a long work, but you can take what you want for a ballet and have no words. AB-M: I like Grisélidis very much but it’s difficult to perform. In France, this opera is still protected by copyright. It’s not in “public domain.” Last year that was a big problem in Strasbourg with it. The producer changed 450 words and cut more than 620 bars. But the problem was that he didn’t cut a scene or an act, but rather two bars cut, two are left, three cut, and left, and so on all over the work. So it was not the real work which was performed. BD: Are you basically pleased with the ideas today regarding stagecraft? AB-M: Yes. Some things I don’t like in the sets and costumes. Some are absolutely ugly, but I don’t think the public goes to the opera to see such things. It’s the fashion, and it will not last – I hope! It’s less of a problem here in the USA than in France and Germany. BD: Do you think operas by Massenet – or by anyone else for that matter – work well on television? AB-M: It all depends on the television director. I’ve seen some which were very successful and others which were not received well at all, and it was because the television director didn’t know a thing about music. That’s very important. We have a good one in France, but he also does some staged operas and films, and that makes a difference. It’s quite special, and an opera is so different from a film or a play. BD: What do you expect of an audience that comes to opera on any given night? AB-M: Opera is a form of art which is quite complete. You have the play and the dramatic sphere, and you have the music, so you have everything. I think that the audience that goes to the opera wants all that. They want to hear nice voices, of course, but I think it’s a whole thing which is more important than just to see Mr. So-and-so. Now comes the problem because on a record you can do an aria ten or twenty times if you like, if it’s not quite perfect. Now the audience seems to wait for that perfection on the stage, which is not possible because they are human beings. I’ve heard performances where it’s gone quite well but one note was not perfect, and people around me say it’s not good. Well, my goodness, it was just one note! BD: Does Massenet work well in translation? AB-M: That is also a problem. Forty years ago, all the operas were translated. Nowadays, all operas are sung in the original language, and I think maybe it may be a mistake because the audience doesn’t understand a thing. And the singers who are foreigners find it very difficult to sing and act in a foreign language. I heard a Don Quichotte in Italian in the 1950’s with Boris Christoff, and it was very good. Some friends said they heard a Werther performed at the Bolshoi in Moscow (sung in Russian) and they told me it was quite good. So, why not? I think it’s better to have it translated than to have some strange accents. It’s better to have it in one language than in something that is between French and another language. I’m sure that this new thing of supertitles in the theater is a very good idea. I enjoy them on the television. When you don’t know a libretto by heart, it can be hard to understand, and some of them can be very complicated. I think it’s better to understand what is going on. It’s theater first of all, theater with music. 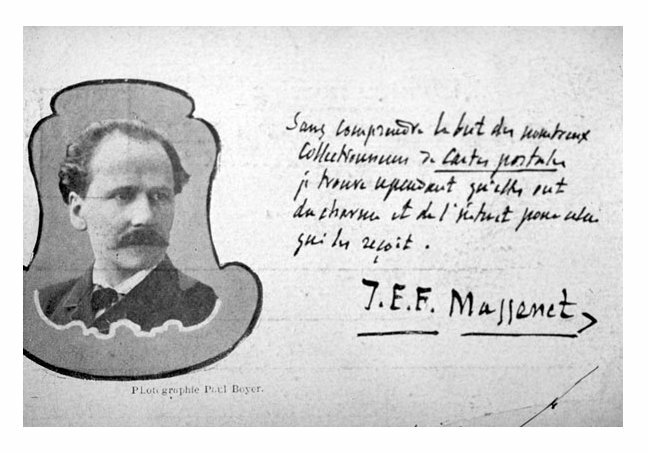 Massenet knew all the things about the theater and about singing. He was a man of theater. He liked it and knew all about it. BD: Was Massenet a genius? AB-M: In some ways I think so. What was very special with him was the diversity in the works. He’s so different when you see all the works. Marie-Magdalène is so different from Manon, which is different from Sapho, which is different from Werther, which is different from Don Quichotte, and they’re different from the piano works. In other composers, you often find an aria is a little the same from one opera to another; in Massenet, never! BD: Is Werther a German work because it’s Goethe, or is it purely a French work? AB-M: I think it’s a French work, but sometimes, he was somewhat German in his character. He wasn’t a sad person, but romantic as Germans are, and in Werther you have that. I think he liked the Goethe story because of his family. BD: Are you optimistic about the future of opera in general? AB-M: No, I am not. The problem nowadays is that you have very few composers for opera, and it will become a museum. Some things are good, like Barber’s Antony and Cleopatra but it’s never performed. There is Menotti, but there are so few new operas, and of the few being written, some you can’t listen to. [See my Interviews with Gian Carlo Menotti.] I’m not alone in thinking that. It has to be modern, but possible to listen to. If composers don’t start to do something, in fifty years opera will be a museum. BD: Are you optimistic about the future productions of the works of Massenet? AB-M: Not very much, I must say. I think we are in a bad period for him. I think he is misunderstood, and that is very difficult to fight. More of his works should be done, and more of the works of his students should be done. In ten years as a professor, he had 18 Grand Prix de Rome among his students. He was a very good teacher. All the students said so, too, and they were very different from him in style. They are all good musicians, yet he didn’t impose his own compositional style, and this is the mark of a good teacher. This interview was recorded on the telephone on February 10, 1987. This transcription was made and published in the Massenet Newsletter in January, 1988. The biography, photos and end-credits were added and it was then posted on this website in 2012.